Swiss chard, or silverbeet, is upstaged in the garden by its close cousins, spinach and beets. 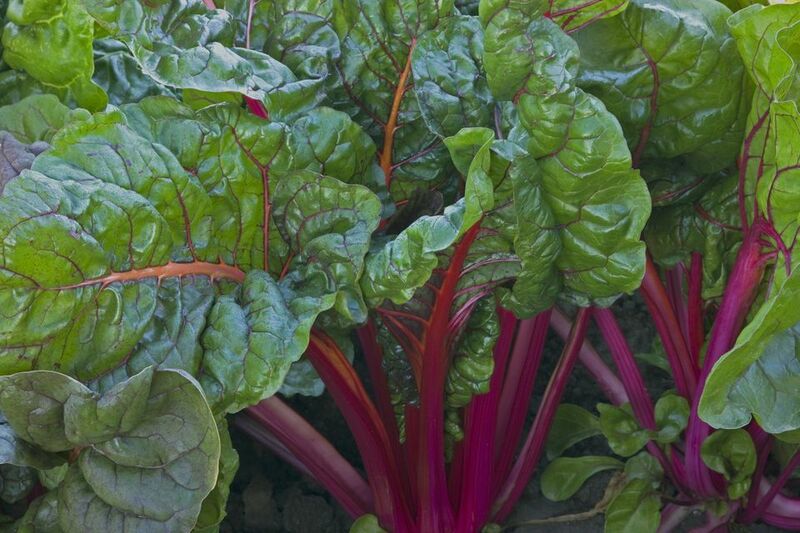 It's an extremely easy vegetable to grow and chard looks as good as it tastes. The glossy, crinkly leaves come in a multitude of colors and keep growing as you harvest individual leaves. Considered a cooking green, young chard is also very delicious fresh. Although chard is a great source of minerals, like calcium, iron, magnesium, phosphorus and potassium, and an extremely good source of vitamin A, it is also surprisingly high in sodium. Leaves: The thick, ruffled leaves have a stiff mid-rib and heavily veined leaves. The leaves grow from a crown, at the base of the plant. Swiss chard can come in a variety of colors, including white, pink, yellow, green, red and orange. Flowers: Chard is a biennial and flowers form the second growing season. Small, perfect, greenish flowers form at the top of seed stalks. Most varieties are ready to harvest in 50 - 60 days. Harvest while the leaves are still glossy. Snap 2 - 3 leaves off each plant, but leave the crown and it will fill back in with more leaves. Hardiness Zones: Chard can over-winter from about USDA Hardiness Zones 6 on up, but it is only a biennial, so it will go to seed quickly in its second year.. Soil: Chard likes a slightly acidic soil pH of about 6.0 to 6.4, although it will tolerate a more neutral soil. Since you're growing chard for its leaves, you'll want a rich soil, with lots of organic matter. Planting: You can start chard from seed or plant. Direct sow seed outdoors, about 2 weeks before your last spring frost date. You can get a head start by starting seed indoors 3 - 4 weeks earlier and planting the seedlings after all danger of frost. You can also seed new chard plants in late summer, for a fall garden. Chard seeds often come in clusters of 2 - 3 seeds, so some thinning will be necessary. Plant seed about 1/2 - 3/4" deep and 2 - 4 inches apart. You'll thin or plant seedlings about 4 - 8 inches apart, although you can always harvest young plants if you don't think and things get crowded. It's better to cut plants when thinning, rather than disturb the roots of the remaining plants by pulling. Keep the plants well watered and harvest regularly, to keep them rejuvenating and extend the harvest. A mid-season side-dressing with compost or manure will keep them fed. If you have poor soil, fertilize with a general purpose vegetable fertilizer. Mulch will keep the soil moist and the leaves clean. Swiss chard can take a light frost, but you will lose your plants if it dips below about -15 degrees F. Chard is a biennial, so plants will need to be overwintered if you plan to save seed. Deer. Probably the biggest pest of Swiss chard is deer. Although it's not a favorite plant, they will eat it when there's not much else available, especially in the fall. Slugs will also chomp on chard; they'll Swiss cheese the leaves and tunnel into the ribs. Cercospora leaf spot can cause brown patches on the leaves. Good air flow will keep it to a minimum. Remove affected leaves. Viral diseases can distort the leaves and stunt growth. There is no cure, but some plants do outgrow the disease, so be patient. "Five Color" aka "Rainbow" - Leaves and stems come in a rainbow of colors. This is actually a blend of different colored plants, each grown separately before the seeds are combined. All are old, heirloom chards. "Fordhook Giant" - Great flavor and a vigorous grower with greenish-white leaves. "Perpetual" - This variety tastes very similar to spinach. Regrows leaves quickly, as you harvest outer leaves. Chop it up and lightly cook as a wonderful side dish. Season with garlic and olive oil or try it with Indian seasonings. You can use chard as a hearty replacement for spinach and the stems can be grilled or roasted, in place of asparagus. Older chard will cook more evenly if you separate the stems from the leafy parts. Chard can be blanched and frozen, for later use, just like spinach.